At Dr. Pardo Ortho, we strive to provide high quality orthodontic care that's safe, effective, and convenient for our patients. Dr. Pardo and our highly trained team of orthodontic specialists work hard to treat every patient on an individual basis; designing specialized treatment plans perfectly suit each patient's unique orthodontic needs. We pride ourselves on using only the most advanced orthodontic technology in our office, which is why we're pleased to offer our patients an exciting alternative treatment to braces: Invisalign Teen. Invisalign Teen uses the same principles and methodologies as Invisalign, the revolutionary orthodontic treatment alternative to braces. Invisalign does away with metal wires and brackets altogether, instead using a series of clear, removable trays - called aligners - to straighten teeth. The aligners are virtually invisible when worn, so you don't have to worry about having braces at prom or in school pictures, and they can be removed to eat, drink, brush, and floss - so no one will know you're straightening your teeth and you can still eat all of your favorite foods! In addition, aligners make it easier to keep your teeth clean – something critical for successful treatment. Treatment is simple – you'll wear your aligners for 22 hours per day, removing them only to eat, drink, brush, and floss. You'll wear each set of aligners for about two weeks before moving to a new pair, and with each new set, your teeth will move closer to their optimal position. Once you're done, you'll have a healthy, beautiful smile that will last you the rest of your life! 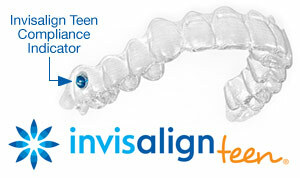 Invisalign Teen takes this same method and customizes it for the teenage lifestyle. Every aligner comes with a built-in Blue Dot Wear Indicator, which tells doctors, parents, and teens if the aligner is being worn enough or needs to be worn more consistently. Additionally, every treatment course comes with 6 extra aligners in case any get lost or broken, and aligners can even have special "eruption tabs" built in, helping to keep space open for unerupted teeth and making it possible to treat a wider range of conditions with Invisalign. Thanks to advances in the technology, it's possible to treat more conditions with Invisalign than ever before. That said, it's not for everyone – in many cases, other treatments, like braces, are best. 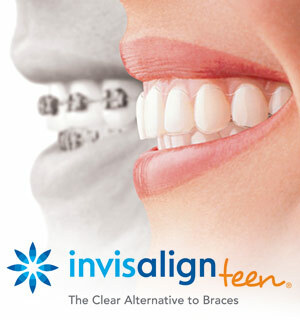 There's only one way to find out if Invisalign Teen is right for you – schedule a consultation! Have more questions about Invisalign or want to schedule your consultation? We're here to help! Feel free to call us at (508) 881-4107, reach out to us at our contact page, or use our easy online form to schedule an appointment at our office. We can't wait to hear from you, and we look forward to helping you achieve a healthy, beautiful smile!